Anyone who has set out to build any kind of a building knows you must start with a good firm foundation or it will all fall apart. Our lives are the same if not founded on the firm morals and commandments we have been given to go by! Jesus is the chief cornerstone of the household of God which Christians bond in unity through the Holy Spirit. (Ephesians 2:18-22). For through him we both have access by one Spirit unto the Father. Now therefore ye are no more strangers and foreigners, but fellowcitizens with the saints, and of the household of God; And are built upon the foundation of the apostles and prophets, Jesus Christ himself being the chief corner stone; In whom all the building fitly framed together groweth unto an holy temple in the Lord: In whom ye also are builded together for an habitation of God through the Spirit. There is no other foundation man can build upon other than Christ and when all is revealed at His return there will be loss to many, except those who have accepted their Lord and Saviour for they will never be destroyed. (1 Corinthians 3:9-17). For we are labourers together with God: ye are God’s husbandry, ye are God’s building. According to the grace of God which is given unto me, as a wise masterbuilder, I have laid the foundation, and another buildeth thereon. But let every man take heed how he buildeth thereupon. 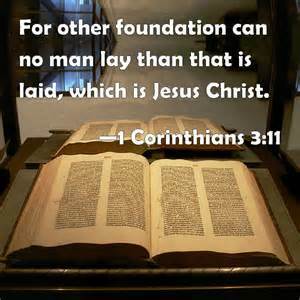 For other foundation can no man lay than that is laid, which is Jesus Christ. Now if any man build upon this foundation gold, silver, precious stones, wood, hay, stubble; Every man’s work shall be made manifest: for the day shall declare it, because it shall be revealed by fire; and the fire shall try every man’s work of what sort it is. If any man’s work abide which he hath built thereupon, he shall receive a reward. If any man’s work shall be burned, he shall suffer loss: but he himself shall be saved; yet so as by fire. Know ye not that ye are the temple of God, and that the Spirit of God dwelleth in you? If any man defile the temple of God, him shall God destroy; for the temple of God is holy, which temple ye are.